The Break Up – He’s Leaving Me! In the wake of the attack on Pearl Harbor all people of Japanese descent were considered to be a threat to the safety of America. As a result, tens of thousands of Japanese Americans were ordered to pack as much as they could carry and proceed to one of the many detainment camps. 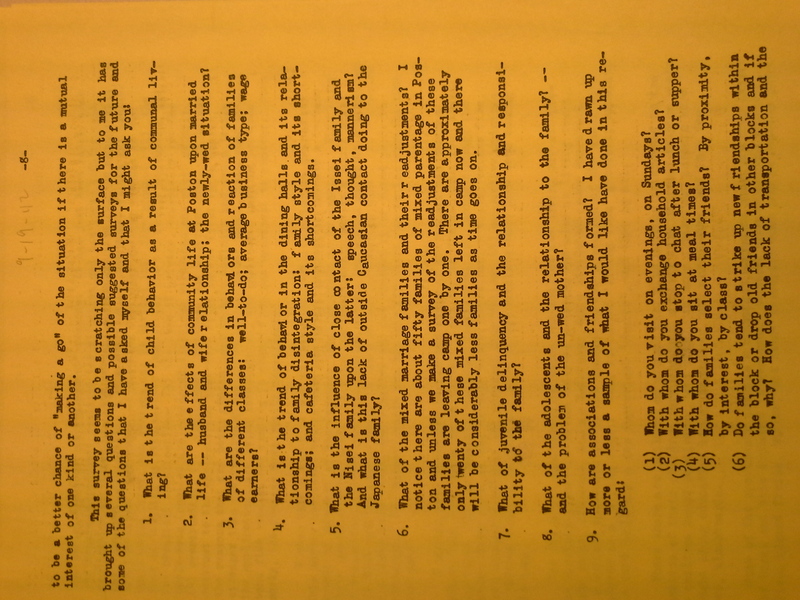 Documents collected by a staff member at the Poston camp include The Family and Its readjustment to the Physical Aspect of Poston, a survey centered on the issues faced by those held inside the camp. 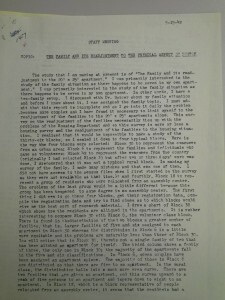 When compared with Toyo Suyemoto’s firsthand accounts of life inside of the Japanese American internment camps it is easy to see that the relocation and subsequent internment that occurred in the wake of Imperial Japan’s bombing of Pearl Harbor negatively affected numerous aspects of Japanese American lifestyles. However, the Japanese were truly crippled by the disintegration of their family structures within the camps. Traditionally Japanese Americans retained a strict and tight-knit family structure. By weakening both patriarchal and matriarchal ties, minimizing parental disciplinary abilities, and stripping family units of their privacy and unity, the internment camps all but dissolved the strong pre-war familial bonds. 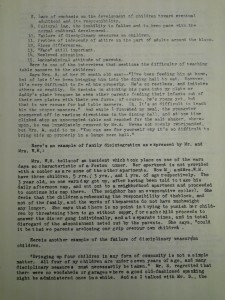 Pre-war Japanese American families were had a tendency towards the establishment of strong family unity and reliance. In traditional Japanese households the father was responsible for making the majority of the family decisions as well as bringing in the majority of the family’s funds. Similarly, Japanese mothers were revered for their domestic contributions. 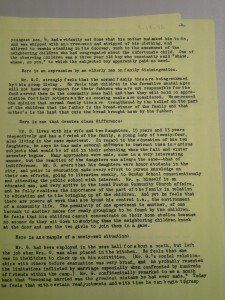 Camp conditions reshaped family relations. 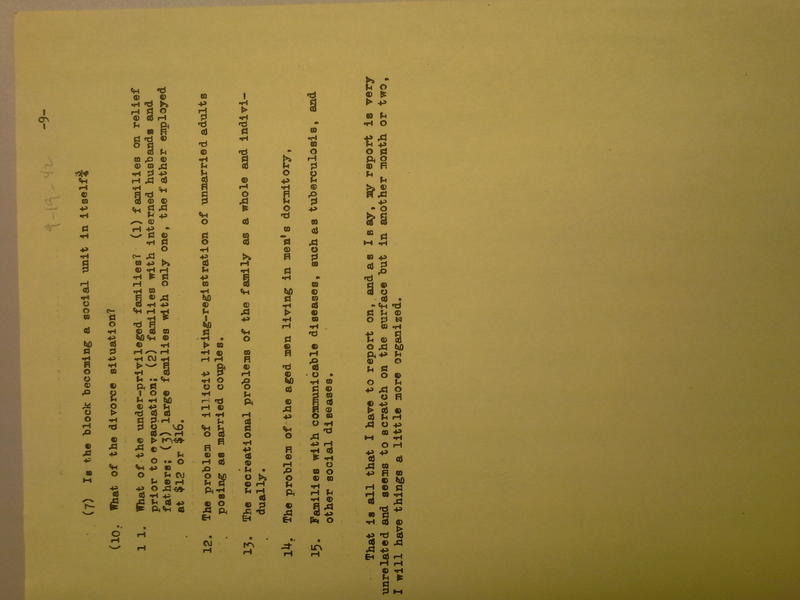 Life in the internment camps was significantly less dependent on the parents. 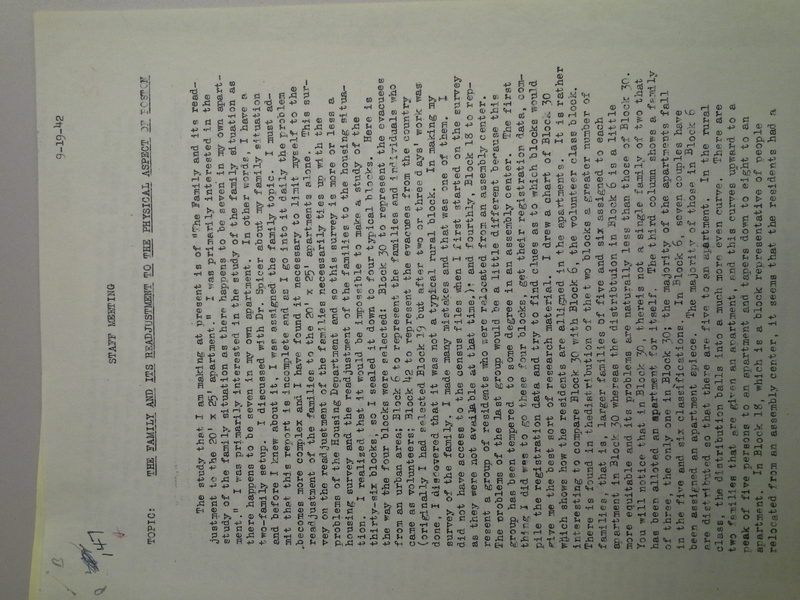 The tradition of tight-knit families and its eventual erosion was attested to by camp internee Toyo Suyemoto who stated that “the prewar family patterns of authoritative father, deferential mother, and obedient children is disrupted by the camp experience”. In fact, the government provided the food rations, housing, and payment for every member of the household in an equal amount. 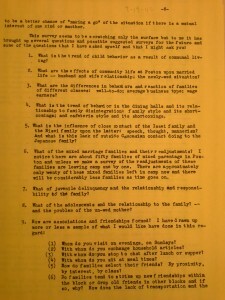 The study conducted at Poston even revealed that “the normal family ties are being weakened”. 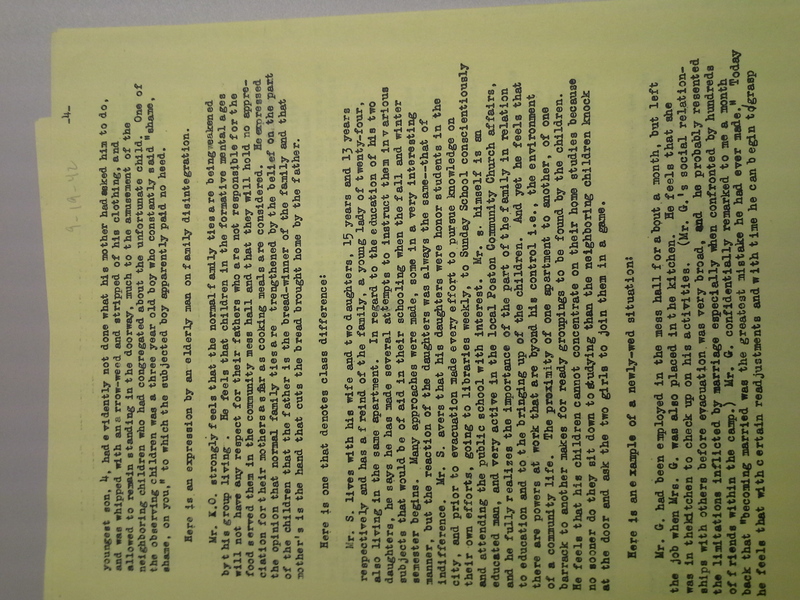 The surveyor, a WRA official, continues on to say that “ the children…will not have any respect for their fathers who are not responsible for the food served in the community mess halls” and that they “ will hold no appreciation for their mothers as far as cooking meals are considered”. This sentiment reveals that, in the mind of the Issei, family ties are strengthened by the recognition of the father as the breadwinner and mother as the homemaker. This fosters a sense of indebtedness and gratitude that breeds respect. However, in the internment camp wages for all workers was equal. Suyemoto mentions a similar sentiment when she states that “before, the home had contained the family, knit closely by kinship and tradition, at camp the circle was dissolved”. She qualifies this statement by adding the “mothers no longer had to cook…and the children did not have to return home for their meals”. In essence, the family structure as a substantial and tenacious bond was eroded. In its place stood a reliance on the government that dictated the rations, allocated the funds, and made all of the rules. The cultivation of dependence on the government rather than the family effectively diverts power and authority toward the state and away from familial role structures. Similarly, taking care of youth became more of a communal responsibility rather than a responsibility placed solely upon the family. 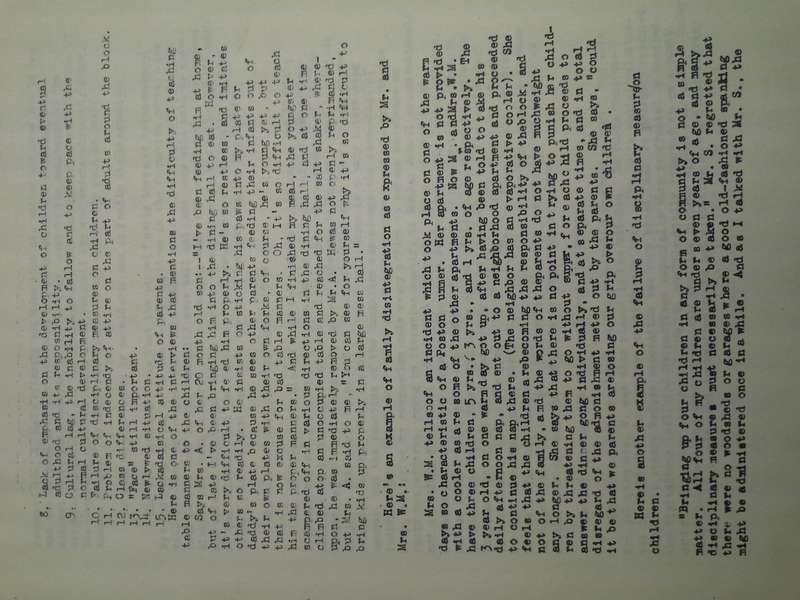 In Mrs. W.M’s note in the survey she reveals that it seemed as if “childrearing was becoming the responsibility of the block, and not of the family…the parents do not have much weight any longer”. A comparable opinion is offered by another woman surveyed who suggests that there existed a “total disregard of the admonishment meted out by the parent”. Due to the fact the parents were stripped of their traditional disciplinary tools, for example sending children to bed without supper, their authority was often challenged as it had never been before. The breaking of these authoritative bonds was also depicted in Suyemoto’s account. She notes early on that “the parent’s roles are stripped away; the family unit is submerged into the communal group…the family surname itself is replaced by a number”. From the physical attributes of the camps to the regulations set by white authority, power was slowly stripped from the Japanese family and individualistic ideals, typical of American culture, developed. 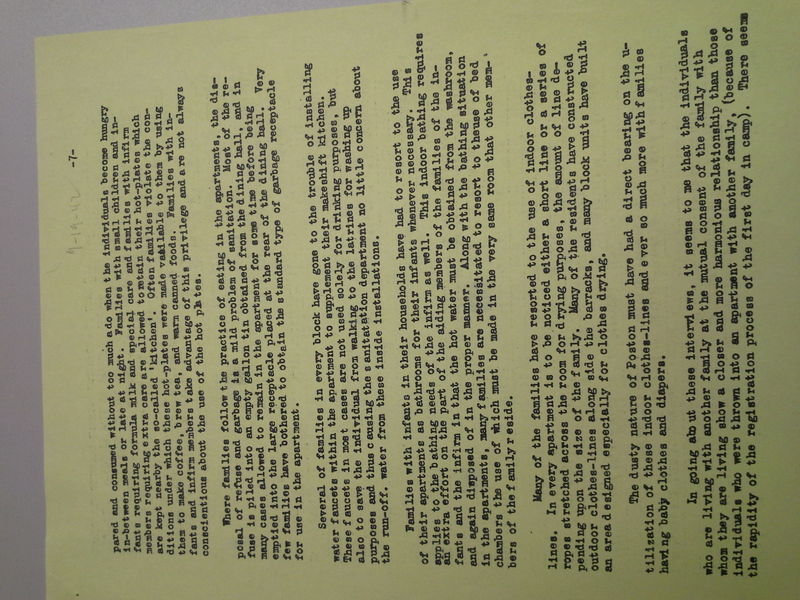 Inadequate housing situations were another factor that further debilitated Japanese American familial ties. 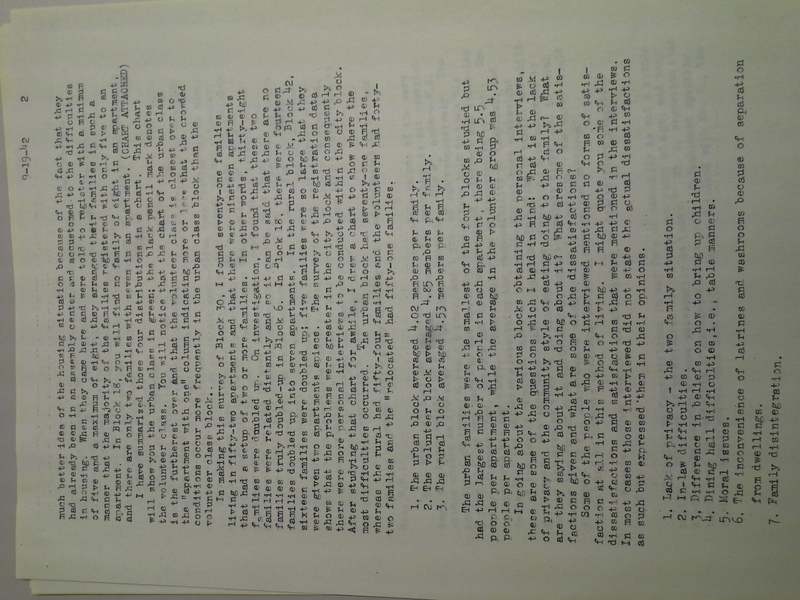 Due to inadequate facilities and often overcrowded boarding arrangements many families were torn apart either by physical separation of lack of privacy. In fact, the survey noted that many “stated ‘overcrowding’ in one sense or another as the chief reason for…the various family disagreements that were coming up”. 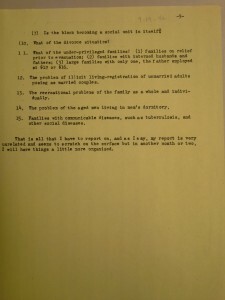 Stripping families of their privacy led to a great number of disagreements and marital discords. 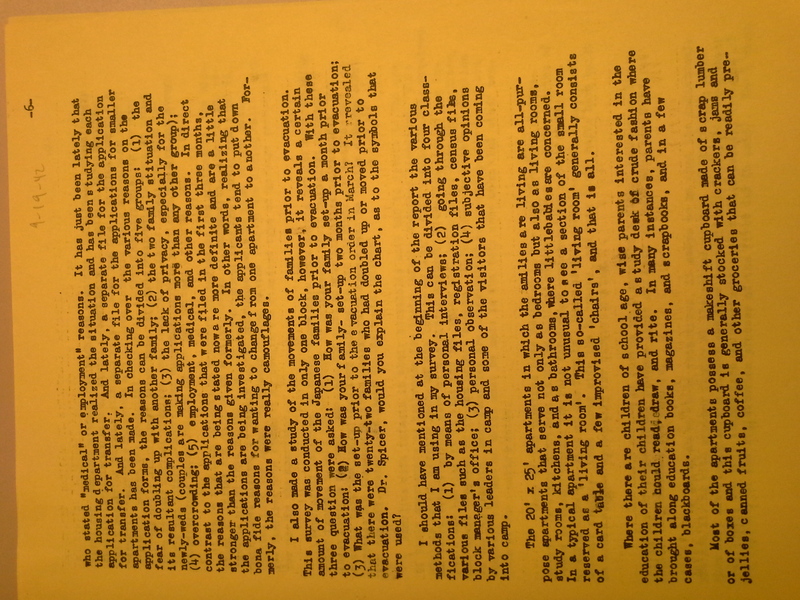 Another issue with housing was presented by Suyemoto, whose housing units “had been built according to designs…for single soldiers, not for families”. She goes on to explain how her brothers were in entirely separated from their family and lived in a completely different bunk. Families that at one time spent numerous hours together were now physically separated from each other. Suyemoto later introduces the idea of communal spaces such as latrines, laundries, and recreational halls “supplant the private home for social gatherings”. Mealtimes, which were traditionally methods of building family cohesion, became a social occasion instead. 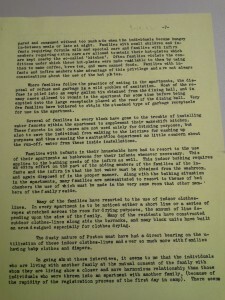 Arrangements in internment camps were by no means desirable or comfortable. In fact, close quarters set people on edge and often families were even physically separated by the rooming arrangements or increased communal areas. These things serve to debilitate the Japanese American families as whole. By doing so, allegiances and reliance lay decreasingly with tradition and culture and more within the institution that defined the living situation, the American Government. The adverse effects of placement into internment camps on Japanese American can be seen from a multitude of angles. These camps disrupted the economic, educational, and social systems that Japanese Americans had in place at the time in a way that was more devastating than some care to admit. One of the few things that the Japanese entered these camps with was their strong culturally based family ties. 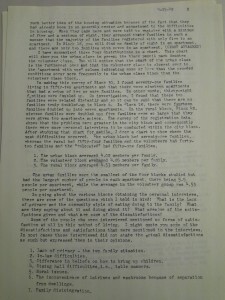 By deprecating strong parental ties, undermining the authority of the parents, and providing subpar housing arrangements, the internment camp environment served to dilute the previously considerable strength of the Japanese family. Valerie Matsumoto, “Japanese American Women During World War II,” Frontiers: A Journal of Women Studies Vol. 8 No.1(1984): 7. Matsumoto, Japanese American Women During World War II, 8. Toyo Suyemoto. “I Call to Remembrance”. Ed. Susan B. Richardson. (Rutgers University Press, 2007), xxxviii. “The Family and its Readjustment to the Physical Aspect of Poston”. Japanese-American Relocation Centers Records, #3830. 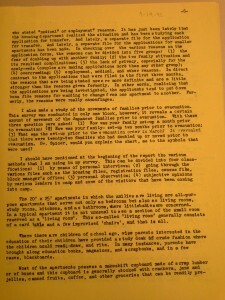 Division of Rare and Manuscript Collections, Cornell University Library, 3. The Family and its Readjustment to the Physical Aspect of Poston, 3. Suyemoto, I Call to Remembrance, xxxviii. The Family and its Readjustment to the Physical Aspect of Poston, 5.